Despite the quiet, there is potential for Earth-directed eruptions. Sunspots 1362 and 1363 have "beta-gamma" magnetic fields that harbor energy for M-class solar flares. NOAA forecasters estimate a 20% chance of M-flares during the next 24 hours. Solar flare alerts: text, phone. 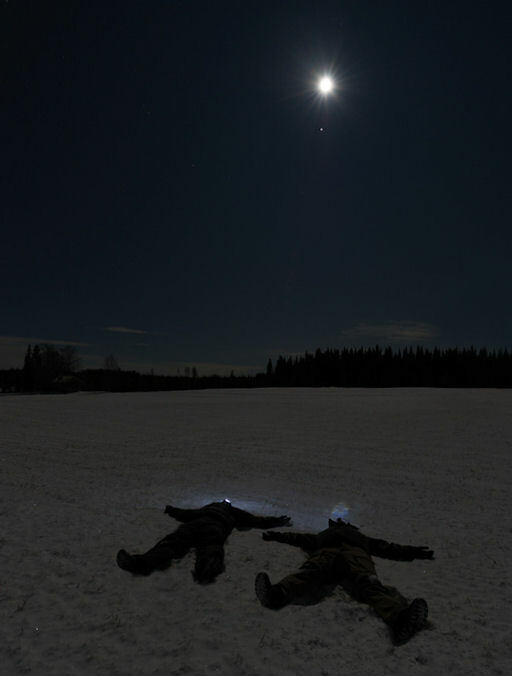 "This is what happened when a friend and I went out to watch the conjunction," says photographer Göran Strand of Frösön, Sweden. "It was a clear and cold night and, fortunately, we found a very nice spot to hit the ground south of Östersund." In case you missed the conjunction, you won't have to wait long for it to happen again. The Moon will spend the next few weeks circling the sky, returning for another meet-up with Jupiter on Jan. 2, 2012. The New Year begins with a knock-out sky show. SpaceWeather Phone (text, voice) subscribers will receive a reminder when the time comes. On December 7, 2011 there were 1272 potentially hazardous asteroids.